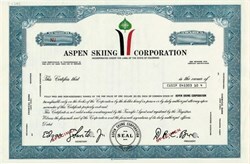 Beautifully engraved RARE specimen certificate from the Aspen Skiing Corporation . This historic document was printed by the Northern Banknote Company and has an ornate border around it with a vignette of a red ski and a black ski with a leaf above them (company's logo). This item has the printed signatures of the company�s president D.R.C. Brown (Darcy Brown). Founded in 1946 by Walter Paepcke, it operates the Aspen/Snowmass resort complex, comprising four ski areas near the town of Aspen. The history of the company has in many ways paralleled, reflected, refracted entertained and tormented the inhabitants of the former silver town hamlet. Born out of the imagination of a cadre of World War II veterans, they hoped to create a skiing wonderland nestled deep in the middle of nowhere Colorado. In fact the company never paid dividends until its sale to Twentieth Century Fox. That is when the ticket prices began to soar. In the 1970s, ticket prices were just over 10 dollars a day. Now they are well over 100 dollars a day. Season passes are nearly 2000. Paepcke, a successful Chicago industrialist, founded the company as part of larger effort at turning Aspen, a somewhat forgotten silver mining town, into an idyllic center for the advancement of the body, mind, and Spirit. As part of the larger effort, Paepcke also founded other cultural institutions such as the Aspen Institute and the Aspen Music Festival. The company established the Aspen Mountain ski resort on mountain of the same name above the town of Aspen. The first chair lift, Lift-1, opened on December 14, 1946 and was the world's longest chairlift at the time. In 1950, the company hosted the FIS World Alpine Championships, the first international skiing competition in the United States. In the following decades, the company opened Buttermilk in 1958 and the Snowmass (originally the Snowmass-at-Aspen Ski Area) in 1967. In 1993 the company assumed ownership and operation of Aspen Highlands, which was founded in 1958 by Colorado Ski Hall of Famer: Whip Jones. Previously, Jones successfully sued Aspen Skiing before the Supreme Court for antitrust violations in Aspen Skiing Co. v. Aspen Highlands Skiing Corp. The Aspen Skiing Company supported in the Water Rights Protection Act. The bill would prevent federal agencies from requiring certain entities to relinquish their water rights to the United States in order to use public lands. In 2012, a court ruled "in favor of the ski companies... that seizing the privately held water rights usurped state water law." However, the United States Forest Service decided to pursue a "new regulation to demand that water rights be transferred to the federal government as a condition for obtaining permits needed to operate 121 ski resorts that cross over federal lands." The Colorado ski industry supported the Water Rights Protection Act because it believed the legislation was "needed to block a water extortion scheme by the Forest Service to withhold government permits unless the companies relinquish their valuable water rights." Vice President of the Aspen Skiing Company David Corbin testified to the House Natural Resources Subcommittee on Water and Power that the company would go out of business without the water. Darcy Brown, one of the founders of Aspen Skiing Corp., died Monday at his home in Tucson. He was 95. A memorial is planned for family, close friends and former employees. Brown, whose full name was David Robinson Crocker Brown Jr., and a handful of other men started the skiing corporation, which they expanded into Snowmass, Buttermilk, Breckenridge, a slope in Spain and two in Canada, said his son David R. C. Brown III of Littleton. The Aspen ski area first had a rope tow and a �boat tow,� which was a wooden boat on which they installed a tractor engine so they could get to the top of a mountain. Brown began skiing as a boy growing up on a ranch in Carbondale. He skied until he was 90. Throughout his life, Brown also owned ranches, including ones in Carbondale, Creede, Utah and Australia. Brown served one term in the Colorado Senate, from 1952 to 1956. A �Barry Goldwater Republican,� according to his son, Darcy Brown later became a Democrat. Brown was chairman of the Denver Branch of the Federal Reserve Board, on the board of the Boettcher Family holding companies and was in both the Colorado Ski Hall of Fame and the Colorado Business Hall of Fame. D.R.C. Brown Jr. was born in San Francisco and moved to Colorado with his family when he was a child. His father had come to Aspen in 1880 and bought several silver mines. Brown graduated from St. Paul�s School in Concord, N.H., and earned a bachelor�s degree in economics from Yale University with a minor in French, in which he was fluent. He was an oil-field worker for Continental Oil Co. and later a scout, lease man and land man. Brown wanted to be a pilot in the Navy in World War II, but he was too old. He became a PT boat skipper. He had his own plane and flew until he was in his 70s, said his son. Brown married Margaret Heintz in 1937, and they had three children. They divorced, and he later married Ruth Humphreys of Denver. They had five children. In addition to her and his son, he is survived by two other sons: Charles Scott Brown of Grand Junction and Albert H. Brown of Hesperus; five daughters: Darcey Brown Kelley of Moab, Margaret Brown Garvey of Grand Junction, Laurene Cochran of Guilford, Vt., Ruth L. Brown of Aspen and Charla Brown of Colorado and France; and nine grandchildren.